I adore the color of concord grapes. Their deep violet hue promises a world full of slightly sweet, slightly sour greatness, and they do not disappoint. While the green and red varieties you typically see are always refreshing, I much prefer concords for their stronger flavor. When it comes to fruits, bold taste is king, and as a wise man once said "The blacker the berry, the sweeter the juice." If you've never had an aviation, then this will truly be a treat. 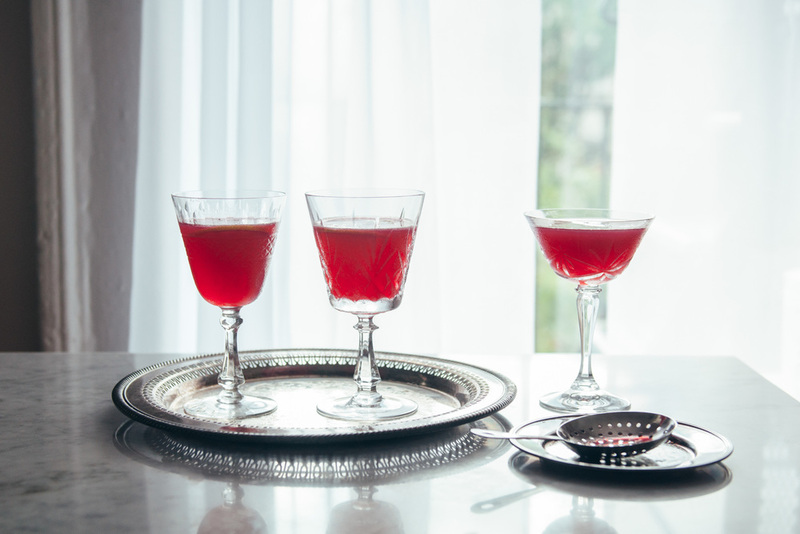 A sultry cocktail in its original form, the perfect mixture of gin, lemon, and maraschino liqueur create an incredible balance between boozy, tart, and sweet. The addition of crème de violette gives the whole production a ghostly blue tint—the very color that inspired its name. This version does not use any crème de violette. While Rothman and Winter have a very nice version, even the slightest addition to a drink brings up memories of stuffy church pews full of elderly ladies coated in entirely too much perfume. Instead, the concord grapes serve both as a great addition to the original sweetening agent (Luxardo maraschino liqueur) as well as provide a fantastic red-purple backdrop that inspire images of a sunset the Wright Brothers surely set into in their feat of daring. P.S. Summer and I have been scheming about a cocktail series for her blog since it's a hobby of ours. I'll be taking over the writing, except for the recipe section (that's still her!). During early fall, you can find concord grapes almost everywhere. If you prefer raw juice, you can either use a blender with a fine mesh sieve or a juicer, if you have one. Otherwise you can cook the grapes until they burst and then press it through a sieve. After you've extracted your juice, it will be quite thick/murky, so if you want some extra clarity, be sure to take it through your fine mesh sieve at least two or three times, then through a fine cheesecloth. I recommend a fairly neutral gin such as St. George Botanivore, or Letherbee Original if you're in Illinois, or Greenhook Ginsmiths American Dry if you're in New York. 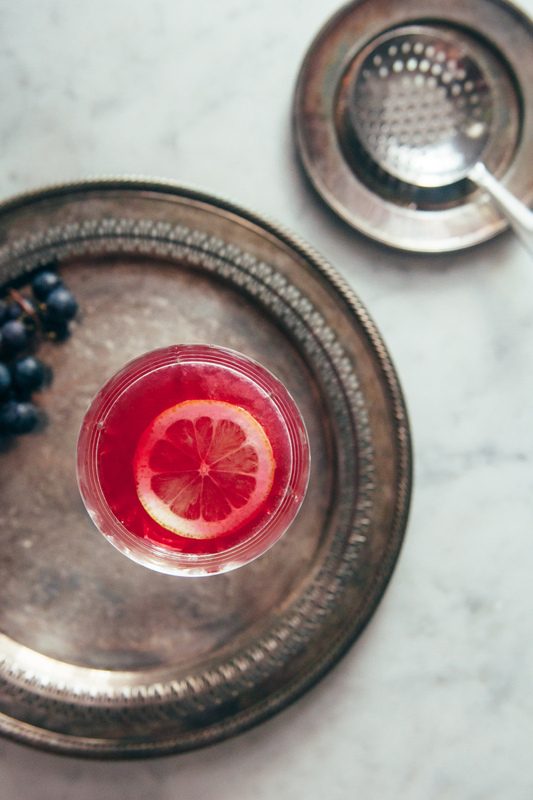 A neutral gin will allow the flavor of grapes to come through better. I find that gins that are very juniper-y make the drink just taste like trees. Depending on how tart/sweet your grapes are, you might need to adjust the amount of simple syrup up or down a notch. In tumbler filled with ice, combine gin, grape juice, lemon juice, Luxardo, simple syrup, and angostura bitters. Cover and shake vigorously for 10 seconds. Pour through a strainer into a chilled cocktail glass. Top with a lemon wheel and enjoy immediately.